The auction was live on the site from July 19 – 29 and the lucky winner received a package deal including the float, an engraved personalized + POOL tile that will be installed at the pool when it is built, as well as a commemorative tile as a keepsake, a Cindy Sherman-inspired canvas tote designed by Virgil Abloh, bearing a quote from Sherman, ““I’d rather be swimming” and a black and white photo of the artist swimming; and a “First Dip” pass tot he pool when it opens. 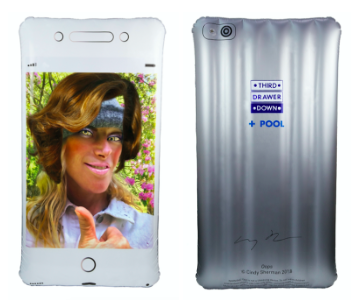 “The only signed Cindy Sherman pool float is a sought-after collectible on eBay for Charity, offering our 171 million active buyers a chance to own a signed work by a recognized artist and benefit + POOL,” said Sam Bright, Senior Director of Art & Collectibles at eBay. Looking forward to seeing what else we might be able to do with eBay soon! eBay for Charity helps enable members of the eBay community to connect with and support their favorite charities when they buy or sell in the U.S. and abroad. Sellers can donate up to 100 percent of the proceeds to a charity of their choice, while buyers can add a donation to their purchase during checkout. To date, nearly $810 million dollars has been raised for charity by the eBay community. Visit charity.ebay.com.